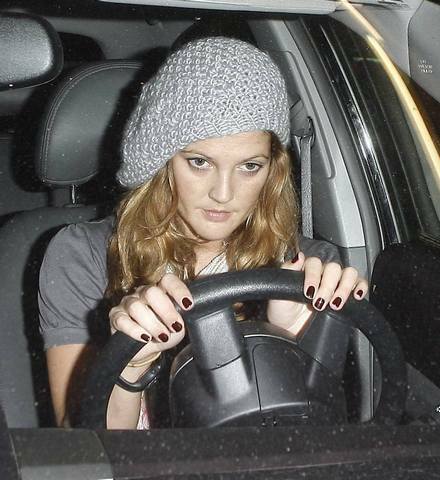 "Actress Drew Barrymore chased a hit and run motorist around Los Angeles after the reckless driver smashed into her car and sped off.... The 50 First Dates star was driving in West Hollywood just before 12pm on Monday when she was rear-ended, reports Tmz.com. But instead of pulling over to exchange insurance details, the perpetrator made off - forcing brave Barrymore to take vigilante action. She eventually lost track of the vehicle, but she did at least commit the offending car's license plate number to memory - and pass on the information. Police are reportedly investigating the incident, but no arrests had been made as Wenn goes to press." I like to imagine Drew being rear-ended and waiting patiently. Then, upon seeing the other motorist flee the scene, scream out, "Aw, HELL NAW!" Superfly blares on the soundtrack as she gives chase, only to lose him when she stops to let an elderly woman holding a puppy, a baby, and a Bible cross the street. "Bless you, child," the old lady says, and she gives the actress a daisy. Drew files the report with a cop, but when she gets to the parking lot, she sees the cop getting into his car--the same one that hit her! The cop looks at her and smiles. Drew nods, understanding. They will meet again.